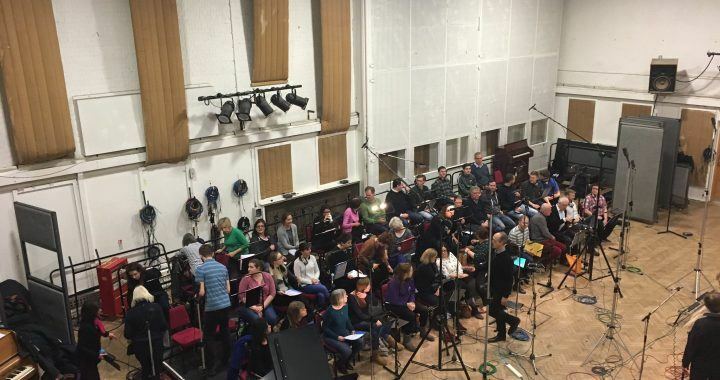 Today 20 singers from Eclipse Choir recorded at Abbey Road Studios for the first time as a session choir. Director, Jim Hawkins, brought together and conducted Eclipse with 21 singers from Opus 32 and some professional singers from the ENO Chorus to record five album tracks for artist, Fox Amoore, given a week’s notice. It was a superb display of commitment, dedication and progress from the last two years of singing together as Eclipse Choir. The members sang with confidence, skill and maintained a professional (and lovely!) attitude throughout the session. They took direction well and responded to all that was being asked of them, all with a smile and a nod. Well done! Here’s a clip taken from the Control Room in Studio 2. Feedback from the composer was how powerful and beautiful our sound was. We look forward to taking on more projects like this in the future.